A budget surplus occurs when government tax receipts are greater than government spending. It means the government can either save money or pay off existing national debt. It is worth noting, that budget surpluses are quite rare in the past 120 years. Politicians have sometimes attempted to enshrine budget surplus into law but what are the economic effects of this? The argument is that with high levels of national debt – periods of economic growth should be taken as an opportunity to pay down debt and reduce the burden for future generations. It also gives the government more room for manoeuvre in a future recession, where government borrowing tends to rise. What is the impact of a budget surplus? 1. Higher taxes/lower spending. To ensure a budget surplus, the government will have to cut spending and/or increase taxes. It depends on economic growth and demographic factors. For example, with an ageing population (requiring more pension spending) achieving a budget surplus will be harder. 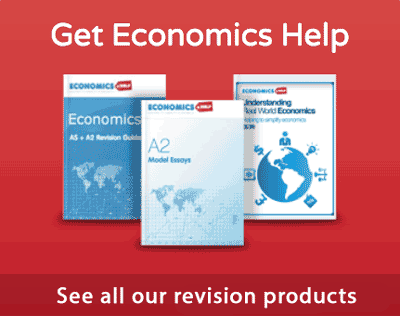 In the UK many tax revenue sources have been falling, (e.g. decline in the use of petrol) therefore, new taxes may be needed, or spending cuts to achieve a budget surplus. 2. Impact on growth. If the government is forced to increase taxes / cut spending to meet a budget surplus, it could have an adverse effect on the rate of economic growth. If government spending is cut, then it will negatively affect AD and could lead to lower growth. A budget surplus doesn’t have to cause lower growth. If the economy is booming, then a budget surplus could be compatible with strong economic growth. Also, even if the government increase taxes, the Bank of England could ease monetary policy to maintain strong growth. 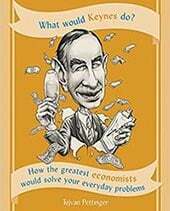 In fact, in a booming economy, Keynesian economics suggests that a budget surplus could help prevent excess growth and inflation. The concern is that the government will be forced into creating a budget surplus when growth is positive, but not strong enough to absorb the deflationary fiscal policy (higher T, lower G). For example, when interest rates were at 0.5% (2009-17), there is limited scope for the Bank of England to ease monetary policy further. The UK recovery is more fragile and unbalanced than we would like – it is arguably not strong enough to absorb austerity – and it is difficult to predict when it will. Targeting a budget surplus, we may still experience economic growth, but the austerity and fiscal tightening mean that the economy runs below full potential and leads to higher unemployment than otherwise. 3. Impact on household debt. Austerity has a strong political appeal because there is a dislike of the idea of debt. But, a government budget surplus could ironically lead to higher household debt. In the financial crisis, household debt as % of GDP fell as consumers/firms tried to pay off debt. This led to a fall in spending, which was partly offset by a rise in government borrowing. However, with the ongoing real wage squeeze, the OBR predicts a rise in household debt in the next five years. If the government pursues tight fiscal policy – higher taxes, lower spending cuts, this will squeeze household disposable income and they may have to respond by increasing debt levels. A budget surplus takes money from elsewhere in the economy. It doesn’t create money. 4. Impact on cost of borrowing. One argument for running a budget surplus is that it will reduce levels of national debt, and push down bond yields and reduce the amount of debt interest payments future generations pay. This will make it cheaper for the government to borrow. 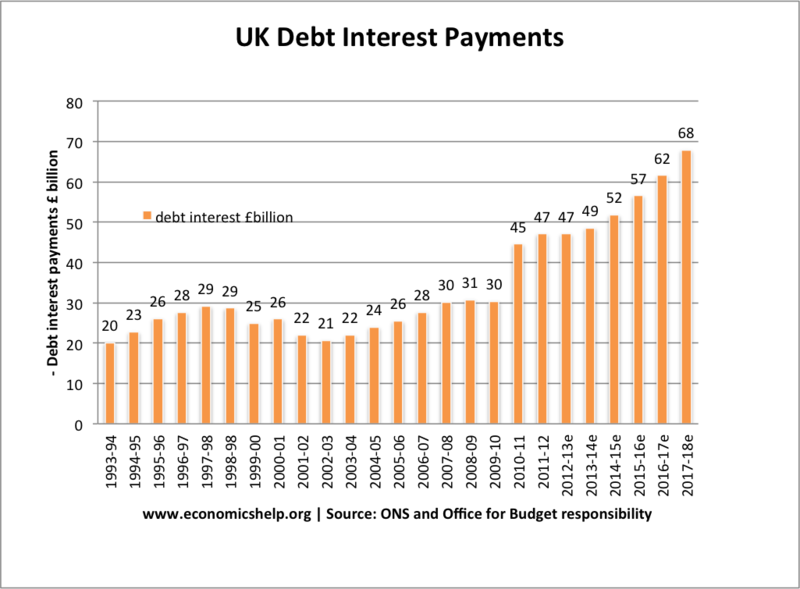 UK debt interest payments are already set to rise. 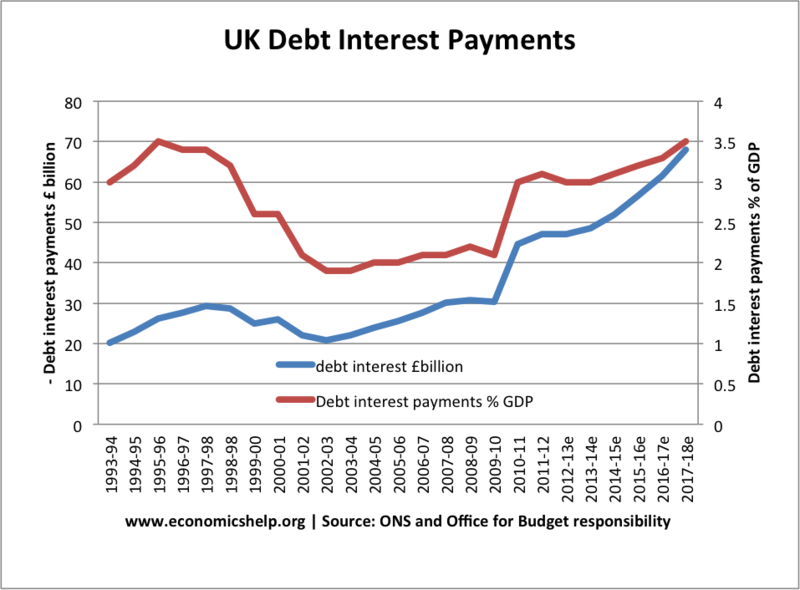 However, as a % of GDP, debt interest payments have been more stable. Also, bond yields in the UK are already very low. so running a budget surplus may have little impact on reducing bond yields. Though others may argue that without cutting deficit now, bond yields will rise in the future. 5. Impact on ability to survive future problems. One argument for running budget surpluses is that it gives you more scope for meeting a future crisis. If you meet a future crisis with debt at 100% of GDP, it may be difficult to pursue expansionary fiscal policy. If debt has fallen to 50% of GDP, there is less need to panic. However, if budget surpluses reduce the rate of economic growth, then this will damage the long-term potential of the economy. 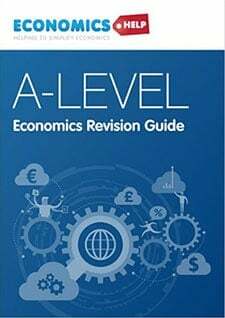 It is worth bearing in mind, that the UK began the 1950s with the national debt at 200% of GDP, but it was no barrier to a golden age of economic prosperity and rising living standards. National debt doesn’t have to saddle future generations with poor prospects. If the government is committed to running a budget surplus, it is likely the government will need to cut back on public sector investment. – Investing in railways, roads, housing, communication, education, skills, training. These are all areas where this market failure. Private firms will not build new roads or fix potholes because they are effectively public goods. If the government cut back on investment, it could harm the long-term productive capacity of the economy. Some feel the idea of government borrowing is very wrong. But, it should be remembered successful firms borrow for investment, households borrow to fund a mortgage. The economy can benefit from public sector investment. The rate of return on public sector works can be significantly higher than the current borrowing costs. The real problem in the UK economy is not the budget deficit, but poor productivity growth. The government can play a role in increasing productivity through investing in vocational training and dealing with transport bottlenecks. But, if the highest priority of the government is running a budget surplus, there will be limited resources to fund this. 7. Is national debt actually unsustainable? 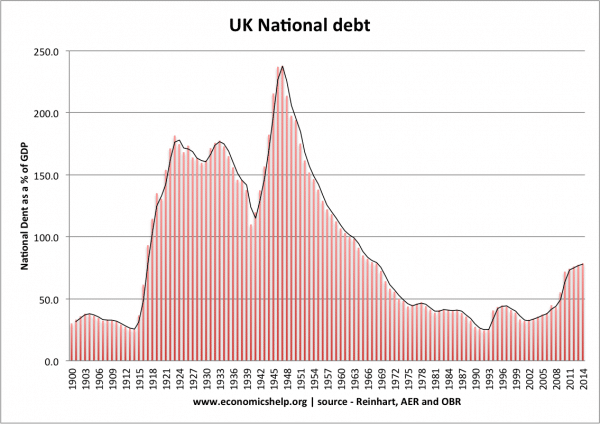 It is much repeated that UK national debt is unsustainable, but is this actually true? For example, demographic trends will place increased pressure on government social security and NHS. These transfer payments are seen as unsustainable because it is not borrowing for investment. This is an important concern. 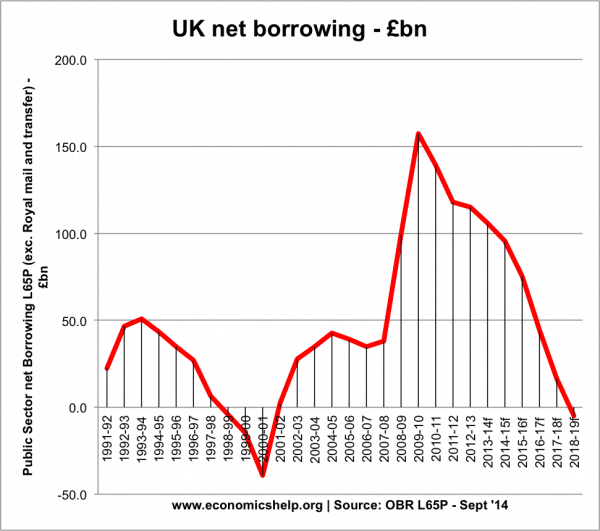 But, if UK debt is unsustainable – why are markets so keen to buy debt? Bond yields are very low, indicating that private firms don’t need high-interest rates to compensate for any perceived risk. I often publish this graph to put UK debt levels into perspective. It is true that some circumstances were different in the 1950s. But, levels of debt are by no means unprecedented. 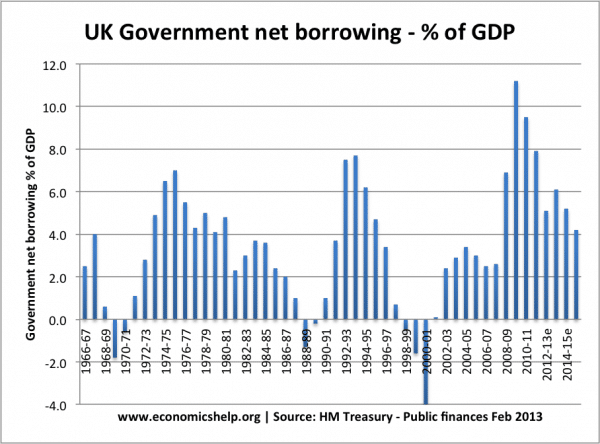 The UK very rarely had a budget surplus 1950- 2013, but will still reduce debt to GDP ratio quite a lot – because economic growth reduces debt to GDP. In the case of Norway and Qatar, they have strong tax revenues from oil. Norway used tax revenues to invest in a national investment fund. Saving money to invest in infrastructure and diversifying the economy. Norway is often cited as an example of a responsible use of a budget surplus – not spending all at once but investing in the future. When growth is strong, it makes sense to improve the nation’s finances and reduce debt as a % of GDP. The counterpoint of expansionary fiscal policy in a recession is that there need to be automatic stabilisers the other way. However, the concern is that making budget surpluses a top economic priority could mean we take decisions which are not in the best interest of the economy. The value of budget surpluses is not that great, but they do come at an opportunity cost of taking money from elsewhere in the economy. Also, at certain times in the economy, there is a strong case for government borrowing to finance public sector investment. We need investment in training, housing and transport to help long-term economic growth. It would be very short-sighted to target fiscal goals. 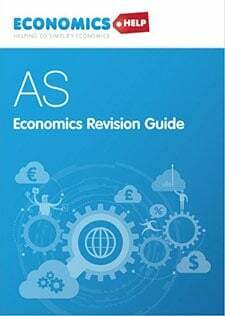 This entry was posted in debt and tagged uk economy. Bookmark the permalink. Why do we need to be in debt at all? Surely all the money in interest (some £50bn pa?) would be better spent on ourselves as a country? Does that not mean that running a surplus would eventually get us out of the red and into the black? I understand that this is a neive way of looking at the economy, but surely long term this would be achievable. Why not? You’d never issue currency if you don’t have debt to back it. Read up on “Monetizing debt” and “Seigniorage”….Essentially all money is Debt….That’s why cash says things like “I Promise to pay the Bearer…..” – Cash is an IOU. 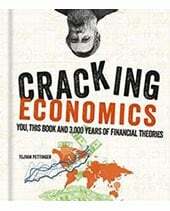 Government debt is money that has been spent into the economy that hasn’t been taxed back yet. We should be grateful that the Government runs a deficit because it means we have more money to use. If the Government ran a surplus money would be sucked out of the economy and would likely cause deflation, slowdown or a recession. The government could borrow money at zero interest if it wanted too. It chooses not too, because the Interest provides a stable income for investors such as pension funds. You should think of interest payments as another form of government spending into the economy. Government spending generally helps the economy grow, creates employment and helps us live our lives. Govt debt shows up as a private sector surplus – money in the economy at work promoting jobs and growth. All major countries run deficits and even the interest paid on debt goes back into the economy and has a stimulus effect. Govt debt also plays a part in the central bank and its cash system. One thing to remember is that a govt budget is NOT the same as a household budget – this is where people get into trouble stressing about paying the nation debt off – the system doesnt work that way.